This is the post I get asked to reshare the most on Facebook so I thought I would pop it up here so I can link to it easily and maybe some of you might find it useful. We went to NYC for the first time ever in July 2017 to celebrate our 17 year wedding anniversary and me turning 40. 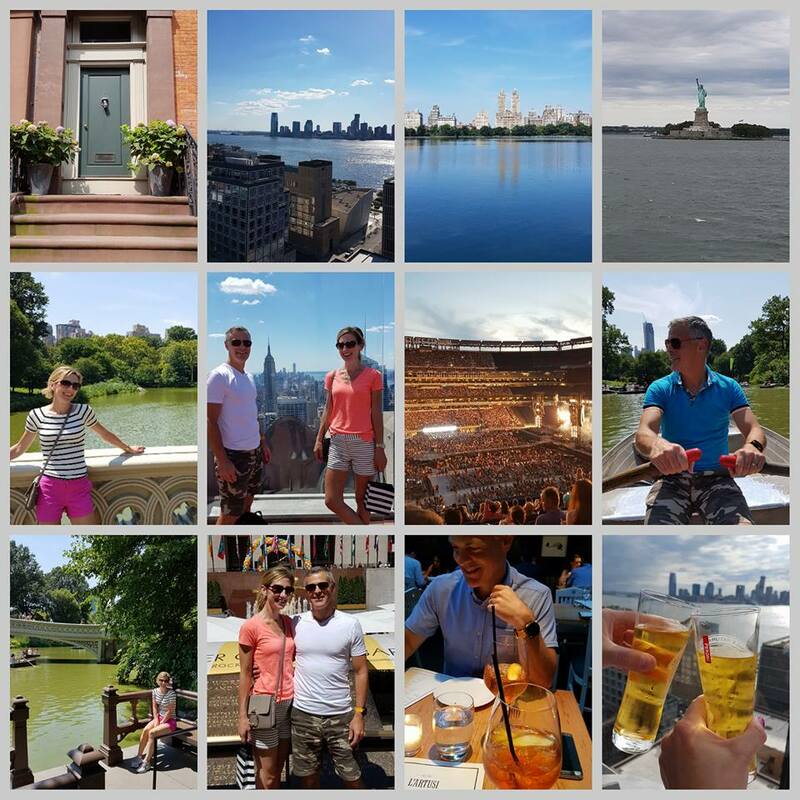 Here’s the post…..
What we did in NYC…..its long so be warned! If you’re not planning a trip, skip this post! We stayed in The Hugo in Soho. Really nice spot on Greenwich Street & corner of Spring Street. Very laid back & loads of good restaurants. The hotel has an amazing roof top bar as well, views out over The Hudson. We arrived in at 3 on Friday & changed & walked the highline, loads of you recommended & well worth it. Headed to The Standard roof top bar for a drink, more great views & retro 70s vibe in the hotel. Then we went to the White Horse Tavern & after The Spotted Pig….delicious food & lovely cosy setting. On Saturday we walked Brooklyn Bridge & had the best breakfast of the trip in Almar in DUMBO. Avocados are basically everywhere. We walked round the park there & then back, fantastic views of the city & skyline. We kept walking to the 911 Museum. We didn’t do the guided tour just walked round ourselves. Very somber but had to be part of our trip. Then hit Century 21. I got nothing 🤣. Paul got a few bits but I wasn’t feeling it. We did the Staten Island Ferry after. It’s free & gives you great views of the Statue of Liberty. The walk back to our hotel through Battery Park & all along the waterway was really lovely. Would definitely recommend this too. Bit too much walking that day but it’s a great way to see the city. The Nikes were needed! That night we did Beauty & Essex, everyone raves about it….now the food was delicious, I just thought it was too loud & buzzy & I didn’t love the street as much as other areas. I am officially a Granny. The mini cronuts for dessert though were delish. Sunday we took the subway to Grand Central Station. Just beautiful, really worth it. Breakfast after was across the road in Pershing Square, amazing pancakes! We walked 5th Avenue…..now that blew me away, loved it. We went into St Patrick’s Cathedral & did Top of the Rock, unreal views of the city & no major queues, staff were all super friendly. We had lunch in PJ Clarke’s, excellent. Subway is great way to get around & not scary like I thought….too many 80s movies ;-). Dinner that night was L’Artusi in Soho…our favourite meal & really lovely atmosphere. Lots of locals. On Monday we went into Times Square….too manic for me…told you Im a granny. We had brekkie in Juniors, nice but other places better. It was just massive….after we were both like “I can’t believe we ate the whole thing”…..we said that a lot. We went to Gotham comedy club that night….some comedians good, some terrible but that was funny too. We were supposed to go to Tao but I reckoned it would be too loud for me….is this 40?? ….so we went to Morandis, delish Italian & ate outside people watching. Could people watch all day long. On Tuesday we did the waterway near Battery Park again for brekkie. Tried Pain le Quotidien, a chain, but it was excellent. More avocados & eggs. Lunch was in Extra Virgin in Soho on the street in the sun just watching people go by, food superb again. Not one bad meal. Then we got bus to Coldplay in Jersey. I have no words other than AMAZING. Took all night to get home & my sandals fell apart but we made new friends..from Lisbon, Brooklyn & Cavan….of course. Ate a burrito on the curb at 2.30am, classy. Wednesday morn we did Chelsea Market…..so many food choices. Amy’s Bread….wow! The food excited me more here than any clothes shopping. That & the views. We had lunch later in a little Sicilian on Spring Street called Piccola Cucina. Delicious again. I’m gonna miss the food but my skinny jeans won’t. It was a struggle putting on long pants yesterday & my ankles are now cankles after the flight. My shopping haul….pathetic. NARS blusher, a tan cross body bag & crest teeth whitening strips. But I do know I love NYC, way more than I thought. I kind of thought it would be overwhelming or something but it wasnt, it was so doable! Just bring Nikes & loads of money…..tip tip tip….two drinks 50 dollars, breakfast 50 dollars….